I found a purplish-plum color t-shirt at the sales rack in Target the other day, it was $2. I went through my fabric stash, and picked this fabric to make a tunic dress. Well, I wanted to make a dress, but the fabric I had wasn't a whole lot. I thought she could wear this with tights or with pants. I worked on this tutorial over that last few weeks while I worked on other projects. I thought I took more pictures to explain things better, but I didn't. If there are some areas that you have a hard time understanding, I am sorry. If you need to see how to made the ruffles, please go here, to see the instructions. That might help a little. 1. From the fabric cut a 2 1/2" Wide X 44" Long strip. Cut it to three equal pieces and fold the strips right sides together in half and sew using 1/4" seam allowance. 2. Turn the strips inside out. Fold the strips so that the seam will come to the one side and press with an iron. Also, fold in both ends and press. 3. Using the largest setting on your sewing machine, make a ruffle. Sew the ruffle onto the middle of the T-shirt. 4. Repeat the process and add more rulles on both sides(Mine are 1 1/2" a part). 6. From the T-shirt strips, cut two 3/4" X 12 1/2" strips. (Save the rest if you want to make a hair accessory later). 7. 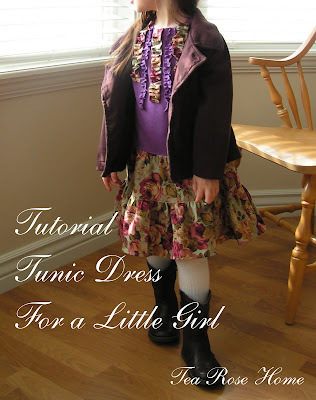 Make ruffles and sew them on between the fabric ruffles. 1. Cut one 5" by the wideth of the fabric strip, cut in half to make it into two pieces. (These will be the top portion of the skirt). Then, cut two pieces of 6" X 36" strips. (These will be the bottom portion of the skirt). Do zig-zag or use a serger to finish both sides of the strips. With the right sides together, sew both sides and make a big loop. 2. Start with bottom skirt, with the largest setting, sew two lines all around. Pull both threads to gather the fabric. Spread the gather evenly for better results. Gather the fabric to fit the width of the top skirt. 3. Attach the top and the bottom skirt. Pin them together first, and make sure the side seams match up, then sew. After you have attached them, turn the fabric inside out and press the seam. Using 1/8" seam sew on the right side of the fabric. 4. Repeat the process for the top edge of the skirt, then attach it to the shirt. Since I still haven't practiced using my serger (shame on me! ), I ironed 1/2" wide strips of interfacing on the wrong side of the t-shirt to prevent it from getting wavy. After sewing the top and the skirt, turn the dress inside out and sew right side of the t-shirt usign 1/8" seam. For the hem, I just did a narrow hem since I did't have that much fabric to work with. To do a narrow hem, fold the raw edge 1/4" twice then sew. It is a rather casual look, but I thought it would be ok. I used leftover pieces and made a matching headband. It is all done, all you need to do is to let your loved one enjoy it. Those of you who have been reading my blog for a while know that I was born and raised in Japan. When we were first married, I was a little worried about how we could combine our two different cultures. My optimistic Mr. layed back said, "Don't worry, we will just take whatever is good from either culture and make it our own." One of the things our family loves from Japanese culture is "Bento". Bento is a single portion takeout or home-packed meal in a box, and very common in Japanese cuisine. Usually, bento consists of rice, fish or meat and other side dishes. This morning was the rare occasion. I packed a Bento for each of them. They loved it. Oh, and I will show you how we wrap our bento box (you know...just a final touch). 1. 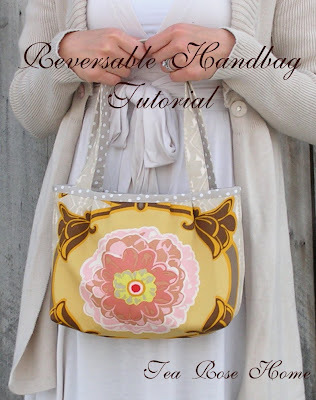 You can use any square fabric. I used napkin this time. Put the lunch box on the fabric diagnally. 2. Fold the front corner to the other side, cover the container and fold the corner under the container. 3. Bring the opposite corner over the box to the front. 4. Take both right and left corners and tie them together using a square knot. 5. You have Japanese style Bento! A tip to make bento is to put three basic colors. Red, Green, Yellow in the container. That way it not only looks pretty, you can also get a balanced meal in one box. I couldn't help it. I had this basket to pretty up for my etsy shop for a while. When I went through my stash of fabrics, I found the perfect brown that would go with the basket. I had to make ruffles. Usually, my baskets have flower clips, but this time I wanted to do something diffrent. I love it. I made a charm with leather string and beads for the basket. My goal was to achieve a feminine look without being too cutsy. I have been working on a tutorial this week and I was ready to take the final pictures, then it snowed today, ugh! I will post it sometime next week. I am super excited for this, I hope you are too. I posted an exciting sponsor giveaway at my sponsor's page today! Head over to check it out and say hello to my sponsor, and leave comments to be entered for a chance to win the prize. Good luck everyone!